I'm back in my hotel room, taking a break after the first tiring but good day at the New York City Comicon. The other guys are doing a panel discussion right now, and I'll be meeting them for dinner shortly. It was a pretty busy day, right from the moment we found our tables. We were signing stuff and doing sketches almost immediately. A lot of nice Turtle fans came by the tables to say hello and get things signed. I'd like to single out two in particular, both of whom surprised me with thoughtful gifts. 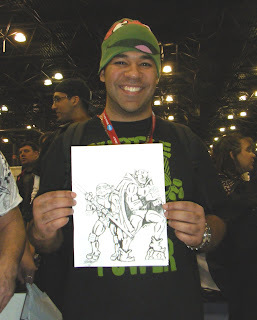 The first was this gentleman who gave me this cool drawing of Donatello and Etrigan the Demon that he had drawn. Nice! 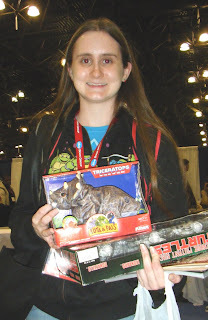 And the second was this young lady who brought me a nifty toy Triceratops. It's the small version of that big Kota from Playschool. I have the big one at home, but I wasn't even aware that this one existed! It's definitely going to join the collection when I get home. I have both of these nice folks' names... but I left them at the con! Hopefully I will remember to bring those names back with me tomorrow so I can give them their due credit. Thanks again! I really hope that April and Casey, and you yourself Mr. Laird, will be at the San Diego Con this year. Its really cool to see your views on how the comic con goes, please post more, I wish I was there. Any word from NECA? I thought the Playmates replacement line would be enough, but while Splinter looks great, that Shredder is pure garbage. And all of the look like the cartoon figures, not like the comics at all. It's now more important than ever those NECA figures see the light of day...they might be there at the con. BTW, did anyone find out if 'April' is single? :)....She's pretty darn cute :)..
BTW, I'm busy editing and uploading some of the Mirage panel. I won't put the whole thing up though... I know the guys don't particularly like being in front of the cameras :). I tried in vain to get today off from work to come down. Ah well. I hope the con is a lot if fun, I am there in spirit! -->> REVERBERATE what COLIN SEZ . Looks like so much fun !! !! 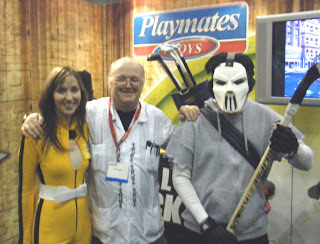 Sarah, i believe that Kill Bill look for April jumpsuit is based on her BTTS fighting suit design. I KNOW THAT KID WITH THE RAPH HAT ..
and the Dinosaur girl !! IS that KAZ .. ~!?!?!?!! What the !! - - - 0_0 DUDE !! Pete did you get to see Vaughn and Stephen and Michelle ?? ?? ?? That is actually my friend Becky and not Kazari. Mr. Laird it has been tremendous fun getting to see you and the rest of the Mirage crew this weekend so far and I can wait to go to the convention again tomorrow! Where can I send you a video and pic of todays 'photograph with April and Casey' event? Awwww, you guys are really sweet! *^_^* Thanks! Ah, I think you're right Tokka! Casey Jones Checking in here.